Wondering what all the commotion is all about around fitness Boot Camps and home workouts like P90X and Insanity? New research published April 5 in the American Journal of Human Biology reveals that high intensity exercise is more beneficial than traditional endurance training. Cardiovascular disease (CVD) is a leading cause of mortality throughout the world and its risk factors have their origins in childhood, said lead author Duncan Buchan from the University of the West of Scotland. This particular study compares the effects of brief, intense exercise to traditional endurance exercises in adolescents. Buchan’s team recruited a group of volunteer school children, forty seven boys and ten girls, and randomly divided the group into moderate (MOD) and high intensity (HIT) exercise teams. The two groups performed three weekly exercise sessions over 7 weeks. The HIT groups training consisted of a series of 20 meter sprints over 30 seconds. In contrast the MOD group ran steadily for a period of 20 minutes. By the end of the study the MOD group had completed 420 minutes of exercise while the HIT group had trained for a shorter 63 minutes. The estimated energy expenditure for the HIT intervention was 907.2 kcal in comparison to 4410 kcal for the MOD group. The results revealed that both groups demonstrated improved CVD risk factors. However, the total exercise time over seven weeks was six times higher for the MOD group compared to the HIT group. Thus, significant improvements in CVD risk factors in the HIT group occurred in only 15% of the total exercise time. These findings demonstrate that brief, intense exercise is a time efficient means for improving CVD risk factors in adolescents. Although limited to relatively small samples, the findings demonstrate significant improvements in cardio respiratory fitness, blood pressure, body composition and insulin resistance in healthy adolescent youth after a 7 week intervention of different exercise intensities. This is the first study to demonstrate the effects of a novel interval training program on both traditional and novel CVD risk factors in adolescents, concluded Buchan. Larger scale and extended interventions must be undertaken so that the long term impact and effects of intermittent training programmers on unfavorable metabolic profiles may be investigated further. While variety is key in any workout regimen, short, intense intervals have also been proven to help aid in weight loss, because of its proven effects in burning fat in the body. In the Weight Loss program at Smart Workout, weve incorporated interval training and endurance training to help burn fat and improve cardio vascular health. Since this program was created as a three-prong approach to weight loss; nutritional education, exercise program design and counseling support; interval training is a key aspect of the program to help clients reach their weight loss goals. As a Fitness Assistant and Ballet instructor, I deal with kids and exercise on a daily basis. I teach multiple level ballet classes to students 5-15 and have developed fitness programs for many pre-teen groups. I love working with kids, and find that there are many reasons why it is important for kids to exercise on a regular basis. 1.) Starting at a young age makes exercise a lifestyle. If you want your child to grow up to be a healthy, happy and active adult, then the answer is to start young. By introducing activity into a childs life at an early age, you are shaping habits that they will keep throughout their lives. Stressing importance on activity without making it feel like a chore is a great way to keep kids healthy. 2.) It gives kids a form of discipline, while still having fun. Wheather its a class, a week-long camp, or a kids exercise program, having your child participate in a structured form of exercises is teaching them structure, how to follow rules, and social qualities. 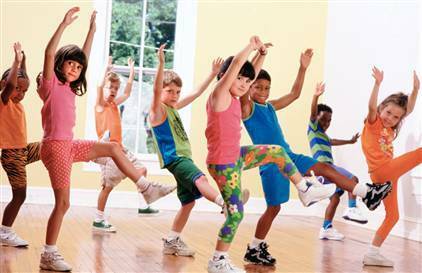 Programs like Smart Workouts Kidz Fit, is a great way for your child to have fun, learn to enjoy being active and learn many other qualities (like paying attention, listening to an instructor, learning to share) that will be useful as they grow. 3.) It may even make your child smarter! Recent studies have shown that healthy, active children tend to do better in cognitive tests as well. Especially when it came to complex memory tests, children that were more fit tended to test higher than those that were considered to be the lower percentile. More times than not, I find active kids to be more pleasant, well-rounded individuals with a real thirst for life. Now why wouldnt you want that for your child? So get out and get moving with them!!! Brain Res. 2010 Oct 28;1358:172-83. Epub 2010 Aug 22. There are many different occasions that will come along that may present a challenge for those of us trying maintain healthy eating habits. I don’t necessarily believe in some of the things that the classic “dieters” will tell you to do. I believe that the more honest you can be with yourself and make healthy eating a lifestyle rather than a diet plan- the better chance you have keeping weight off for the long haul. Sharing is Caring- I know people who will box half of their meal and eat the other half. This doesn’t always work for me. I, however, love splitting things with friends. We will often share an entrée- that way we can have some wine and enjoy chatting. Don’t start on empty– If I know I’m going out to dinner- I actually do the opposite of what most people do. I don’t eat little or nothing all day to save it- I actually go on a slightly full stomach. This works because I can’t eat too much- and I have a great doggie bag to portion out when I get home! Get a starter- Yes, I just told you to get an appetizer, but let me be specific. A non-cream based soup or salad will provide you with fiber and keep you full. This rule ties into the idea of the previous tip of filling up your stomach before the meal. Think recovery- Ok, so you didn’t stick to the rules. It can happen. The best tip I have? Schedule a small group class or a training session for the next day. Do this and confirm BEFORE you leave for dinner. Even if you overindulged, you can feel a little better about it! By now I am sure that all of you have already seen, taken and/or heard of spinning. Spinning is becoming an increasingly popular exercise class and workout. So if you are already a spin lover or have yet to take a class, read on to find the top 5 reasons why spin is so beneficial and get yourself on a spin bike! In spin, there is not a single minute that goes by where you are not pedaling. As most spin classes are 45 to 60 minutes in length, this means that you are constantly moving for at least that amount of time, making for a great cardiovascular workout. Spin classes combine speed and resistance training while moving between different positions. Segments of the class call for high resistance which targets every major muscle group in the lower body, including your abs. Pushing through resistance over a prolonged period of time (45 to 60 minute class) will provide the muscular endurance that your body seeks. Pedaling on a stationary bike means puts no impact on your joints. So unlike walking or running, spinning is a pain free exercise for your joints. Throughout a spin class, the instructor will direct each participant to increase or decrease the resistance on your individual bike. You are the only person who can not only adjust the resistance on your bike but who can increase/decrease the pedaling speed, therefore giving you the control over the intensity of your workout. For a beginner spin participant, this allows you to adjust to the class at your own pace. For an experienced spinner, this allows you to intensify your workout as you see fit. Music and instructor motivation make spin a class where it is hard not to feel good about yourself after it is all said and done. Pedaling to a beat and hearing words of inspiration from provides for an upbeat, positive class that makes it fun to be burning calories. If youre ready to get rolling towards your weight loss goals, visit our website www.smartworkout.com for more information!